Whole9 guest post by Coach Rut, who participates in the sport of weightlifting and is the current Kansas State Champion and the 2006, 2013 and 2014 National Master Champion at 94kg. Having spent half my life in the health, fitness and performance industry, I have observed a number of consistencies. One that constantly stands out is the lack of program structure that exists with the daily workout routine. I’m not talking about long term training structure. That’s another story and an industrial sized can of worms. What I’m referring to is the daily workout structure. That period of the day when we can all get in touch with our inner athlete and pump some life into our now civilized DNA. My observation and impressions reveal that a grab bag approach to training takes place. Do a few jumping jacks, run around the block, stretch a little and then start in on whatever strikes your fancy. This leads to potential injury, poor results and most importantly it is an enormous waste of time. The daily training structure I’ll share with you today is intended for that individual working out in his own gym. I’ll assume that if you are going to group format strength and conditioning program that you are receiving a structured approach. Let’s hope. This daily structure has been a successful recipe for many hundreds of athletes looking to gain multiple physical qualities necessary for athletic performance and endeavors. I’ve coached these individuals in person and via other means. 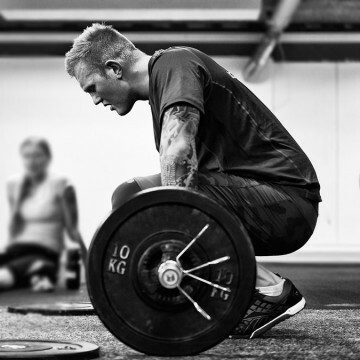 There are a few variations to this theme, but you should find this approach more than adequate at improving the 10 General Physical Skills outlined by Jim Cawley and popularized by CrossFit. The objective here is to elevate the core temperature and signal the nervous system of the upcoming stress. Jumping jacks, rope skipping, and jogging are good examples. Then there’s my favorite: the Concept 2 rowing ergometer. Movements are performed to “fix” what is wrong with your mobility. This is determined via a functional movement assessment or screen (FMS). There are any number of resources for this. I’ll leave to you to track those down. This is also a good period of rehabilitative movements prescribed by a medical authority. This period is dedicated to development of absolute strength. There are multiple training templates and approaches. Literally hundreds of books exist on the topic. For our purposes this is express via the ‘lift of the day’ and the rotation of total body, lower body and upper body. Incorporating the money moves like deadlift, squats, presses and if capable the olympic movements. This can be expressed via any number of means but should fit with your goals and objectives. In general, a mixed mode or CrossFit approach yields the best results in the shortest amount of time and is the most enjoyable. This is the period can bring out the competitor and should have an element of play and enjoyment. In my practice we prefer a maximum of 15 minutes for most conditioning designs. Combining functional movements that fit well with the strength training move of the day is something that improves with practice. Use your internet connection and GOOGLE CrossFit workouts. You’ll die before you exhaust the conditioning options. It is the opinion of this author, that significant amounts of direct core training should be reserved for the later stages of the training day. Placing this focus in the early stages of training could pre-exhaust the midline and unnecessarily expose an athlete to injury. A well constructed program will condition the midline and (PC) but certain individuals need the additional assistance. The big three for us include RDL, Nordic Hamstrings, and Good Mornings. Time to hit the major muscle groups and the bothersome spots. Again, many books and many experts. More isn’t necessarily better. Some have taken this to an extreme and over do this period. The other fault is in taking the roller and using it as a backrest. Get your work down and get moving. This configuration should provide the structure you need to yield you 80% of your potential with a three times per week practice, but your mileage may vary. Michael Rutherford (a.k.a. Coach Rut) has over a quarter century of fitness coaching experience including working with competitors from the ranks of international, Olympic, collegiate, high school, middle school and elementary school aged athletes. Coach Rut also has worked in hospital wellness environments and rehabilitation clinics. All of these experiences have allowed him to bridge the gap between the needs of the competitor and those of the man, woman and child seeking enhanced personal health and fitness. Coach Rut’s Boot Camp Fitness program is the area’s largest and most established group exercise program and his training services have assisted thousands of Kansas City residents over the last two decades. Coach holds academic degrees in biology and physical education, and Master’s degrees in exercise physiology and sports biomechanics. He is a certified Club Coach by the United States Weightlifting Association and is a CrossFit level III certified coach. This info is something I have been looking for (from a trusted source at least) for months now. And lo behold I’ve been doing it almost right!! Cheers for the post guys! Great post. This is very helpful for us lone wolf exercisers. :-) Bookmarked. I have a question regarding the “Rotating Total Body, Lower Body, Upper Body”. Is that still within the workout itself? Meaning within the 20 strength minutes of a single workout would I use all three types (Total Body, Lower Body and Upper Body) of exercises? If so, that doesn’t seem to be much time for each type. I know with compound exercises there would be good overlap but it still seems short. Or would the rotation be between workouts (i.e., do Total the first workout, Lower the second and Upper the third, or maybe 2 types per workout)? YOU ONLY PERFORM ON MOVEMENT IN A SESSION. SO THERE WOULD BE CLEANS ON MONDAY (T) BACK SQUATS ON WEDNESDAY (L) AND PRESS ON FRIDAY (U) THERE IS AN ADVANCED TEMPLATE IN WHICH YOU PERFORM A MOVE FROM EACH CATEGORY BUT STICK WITH THIS FOR A COUPLE YEARS. I wish some resources or links were included for each section. I have been at a personal training studio for five months but don’t know what hardly any of this means.